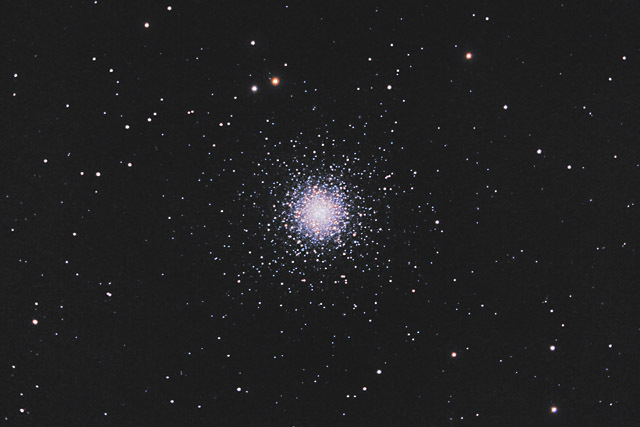 M53 is one of about 250 globular clusters belonging to our Milky Way galaxy. At a distance of 60,000 light years, M53 is one of the more distant globulars. The globular contains many older red stars, but it also has a number of blue stars. Such young blue stars are fairly uncommon in globular clusters. One atypical feature of this image is that I collected all of the subexposures for this image when the Moon was Full (actually, it was taken on the night of the "Super Moon"). Usually I don't photograph when the Moon is out, as the bright light from the Moon washes out the faint parts of most images. However, I was able to capture this image fairly well, because globular clusters consist entirely of stars. Almost all of the stars are individually brighter than the background light from the Moon, so the bright Moon has little effect when imaging globular clusters (as well as open clusters). In this photo, North is up. This image is cropped to 64% of the original full frame. Software Used Images Plus 4.5 for camera control, calibration, stacking, digital development, multiresolution sharpening, smoothing and noise reduction. Photoshop CS5 used for levels and curves, color balance, high pass filter, star shrinking, saturation adjustments, and noise reduction. Gradient Xterminator for gradient removal. Carboni Tools for additional saturation adjustments, noise reduction, and smoothing. Notes I was pleasantly surprised with the nice quality of this image, even though the Moon was full. The downside to imaging when the Moon is so bright is that this image is almost completely devoid of background galaxies. Nonetheless, it shows the globular well, so I think it was a worthwhile compromise.